I know, I KNOW, I wasn’t going to do any more posts this year . . . and I don’t want anything to take away from the wonderful time we’re enjoying with our family . . . so I promise this will be a quick one. When I received these pictures of the Christmas Porch at Our Lake House I just couldn’t help sharing them with you. By the way, I also know that this isn’t OUR lake house any longer, but we still feel a great connection to this home, even more so because our dear friends John & Debbie purchased it from us. So many happy memories were made in this house on the lake and we’re very happy to know that our friends are enjoying living here too. I think she’s done a magnificent job of giving her front porch a welcoming Christmassy feeling. into one beautiful front porch vignette! Totally Pinworthy, don’t you think? Debbie says she has always dreamed of having a front porch to decorate. Now her dream has come true. 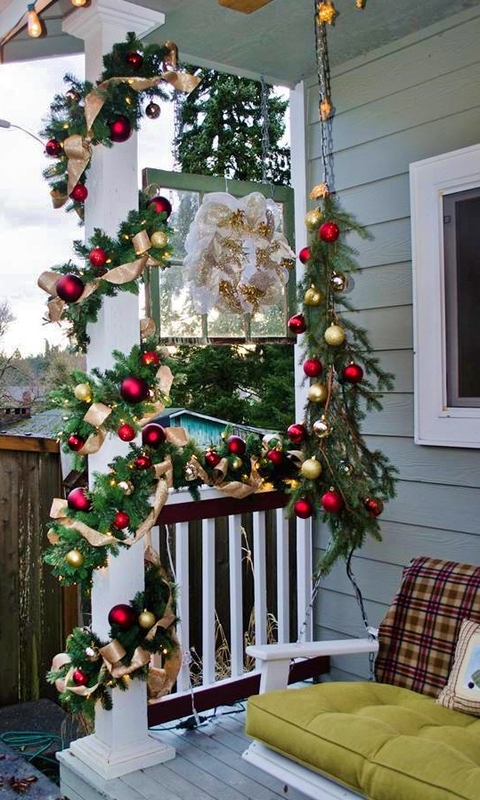 Look out Deb, you may soon have other people coming to you for help with their front porch décor! Back to the family now . . .
Christmas Blessings to you dear readers! So beautiful. In sure you were probably her inspiration, Patti! Oh, what a thrill to have someone care for your previous home with the same attention to detail!!! Thank you for sharing the front porch with us, dear friend!! !